LaQuinta, Woodbury MN - PLC, Inc.
GrandStay Delano MN - DesignWise Inc.
Best Western Shorview MN - DesignWise Inc.
GrandStay Hotel, Glenwood MN - DesignWise, Inc.
Best Western, New Ulm MN - DesignWise, Inc.
Holiday Inn, St Paul MN - DesignWise, Inc.
Barons Lodge, Kildeer ND - DesignWise, Inc.
October 2013 - Harrah's Casino, Cherokee NC - Working with Target Commercial Interior, we produced bedding items for the renovation of this property. October 2013 - HomStay, Dickinson ND - Inn Fashion was happy to work with Target Commercial Interiors on the window treatments and some bedding items for this new property. October 2013 - Henricksen, Minneapolis MN - For their new assisted living facility in North Dakota, we worked with Henricksen on producing and installing the resident room and common area treatments. October 2013 - Senior Lifestyle Design, Minneapolis MN - Inn Fashion produced all of the window treatments for their new assisted living facility in Minneapolis. September 2013 - Holiday Inn, East Peoria IL - We had the pleasure of working with Heart of America on producing and installing all of the window treatments at this new property. July 2013 - Palace Casino Hotel, Cass Lake MN - Inn Fashion worked with Target Commercial Interiors and produced and installed all new window treatments. June 2013 - Hampton Inn, Jamestown ND - Inn Fashion worked with Furniture Industries on producing and installing all of the window treatments for this new property. June 2013 - Radisson, Roseville MN - In need of new dustskirts, we worked closely with Target Commercial Interior and Wave Renovations on manufacturing skirts to their exact specifications and time requirements. June 2013 - Best Western Ramkota Inn, Bismarck ND - We worked with Commercial Interior Decor on supplying this property with new draperies and cornices. May 2013 - Mt Olympus Resort, Wisconsin Dells WI - Inn Fashion was happy to provide this property with new window treatments for their recently acquired properties. May 2013 - Millennium Hotel, Minneapolis MN - Inn Fashion was pleased to work with Target Commercial Interior on the manufacturing and installing of the lobby and 14th floor meeting / ballroom window treatments. May 2013 - Powderhouse Lodge, Keystone SD - Another new customer to Inn Fashion, we supplied the Powderhouse Lodge with all new bedding products. April 2013 - Zion National Park Lodge, Springdale UT - We had the pleasure of working with Archdeacon Design for the first time on completing their window treatment project for the lodge. April 2013 - HI Connect Design, Nashville TN - Inn Fashion had the pleasure of working with some outstanding designers and procurement companies; Matchline Design Group, Jaguar Hospitality and Fourth Dimension Design on producing items for two different vignettes at this show. 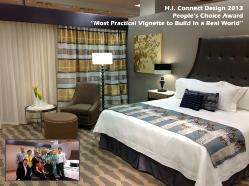 Our vignette with Matchline Design Group was awarded the "Most Practical Vignette to Build in a Real World". April 2013 - Fortune Bay Resort Casino, Tower MN - Inn Fashion continued with their long standing relationship with Fortune Bay by manufacturing and installing new guestroom window treatments. April 2013 - Americinn, Inver Grove Heights MN - We had the pleasure of working with Premier Purchasing on the production and installation of all new window treatments for this property. April 2013 - Kelly Inn, Bismarck ND. Inn Fashion worked with Commercial Interior Decor on procuring roller shades for all guestroom windows. March 2013 - Coal Country Inn, Stanton ND. We worked closely with the property owners and Target Commercial Interiors on the production and installation of all window treatments and bed coverings. February 2013 - Holiday Inn Express, Worthington, MN. Inn Fashion produced and installed all window treatments on this new property. February 2013 - Sofitel, Minneapolis MN. All meeting room sheers were produced and installed by us, we worked with Target Commercial Interior on completing this project according to specification and on time. December 2012 - Madison Concourse Hotel, Madison WI. Inn Fashion had the honor of producing all of the window treatments for the remodel on this property. November 2012 - Gateway Hotel & Convention Center, Des Moines IA. Inn Fashion worked closely with Invision Hospitality to produce their bedding needs. November 2012 - Inn Fashion is currently working on the conversion of the Comfort Suites in Olathe, KS to a Holiday Inn Express. We enjoy working closely with Heart of America on this project to ensure everything is completed correctly and on-time! October 2012 - Inn Fashion participated in the WH&LA Trade Show at the Kalahari Resort in Wisconsin Dells, WI. Thanks to all who stopped by our booth! October 2012 - Inn Fashion completed production and installation of the new addition at Skydancer Casino Resort in Belcourt, ND. It was great working with Tom Sklar at TR Design Group and Julie Spiering at DSGW Group. August 2012 - Inn Fashion had the pleasure of working with Trang at Space As Art design firm in Sarasota, FL producing bedding products for the Sea Club V Beach Resort. July 2012 - Inn Fashion just wrapped up the production and installation of all window treatments at the new Hilton Garden Inn in Olathe, KS. We enjoyed working with everyone at Heart of America in achieving total satisfaction on their project! 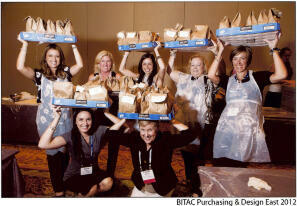 July 2012 - Inn Fashion attended BITAC Purchasing & Design East. It was a wonderful conference, giving Inn Fashion the opportunity to network and build new relationships. While there Angie was part of the winning team "Ladies of Hospitality", making the most peanut butter and jelly sandwiches in a 20 minute time frame. This contest was part of Hotel Interactive Charities which supports Feeding South Florida. To date this program has yielded 9,600 meals for the hungry and raised over $36,000 with the help of BITAC family members. April 2012 - Inn Fashion just finished the production of the second LaQuinta Inn & Suites property for INNgenuity Design. This hotel is located in Minot, ND and we supplied bedding and window treatments. March 2012 - Inn Fashion completed installation of all guest room window treatments at Swinomish Casino Resort in Anacortes, WA. What a beautiful property they have and we enjoyed working with Target Commercial Interior on this project. March 2012 - The new LaQuinta Inn & Suites in Dickinson, ND project was just completed by Inn Fashion. We manufactured all window and bedding treatments for this property and enjoyed working with Lois of INNgenuity Design. March 2012 - Radisson Hotel & Suites in Branson, MO was Inn Fashion's most recent project completed. We worked closely with Carol Meyers at Premier Purchasing & Design in Mechanicsburg, PA in order to make certain that the customer was completely satsified! February 2012 - Inn Fashion had the pleasure of working with Austin Hospitality on the Holiday Inn Express Sioux Falls, SD property. We produced and delivered draperies, sheers, side panels, cornices, bed scarves and dust skirts. January 2012 - Prairie Meadows Casino and Resort project is complete! We wrapped up installation of all window treatments that we produced for their guestrooms. Keep an eye open for new photos appearing on our website of this spectacular facility. January 2012 - We just wrapped up production and installation of all 311 guestroom window treatments at the Holiday Inn - Sioux Falls, SD. It was our pleasure to work with Lester Hospitality on this project! December 2011 - Inn Fashion completed the production and installation of all window top treatments at the new Harmony River Living Center in Hutchinson, MN. November 2011 - Inn Fashion participated in the WH&LA Trade Show in Appleton, WI and we also sponsored the "Women In Lodging" corner. Thanks to all who stopped by our booth and visited us! October 2011 - Happy Halloween! The NEWH Regional Tradeshow in Chicago, IL was a great success. We met quite a few new people and were able to visit with some familiar faces as well. We look forward to working with some of our newest contacts. October 2011 - Inn Fashion will be attending the NEWH Regional Tradeshow in Chicago, IL. Please stop by and visit us at booth #421! September 2011 - Inn Fashion is finishing up the manufacturing and installation of new window treatments at the Best Western White Bear Country Inn in White Bear Lake, MN. May 2011 - Inn Fashion just completed the installation of window treatments at Grand Falls Casino and Resort located in Larchwood, IA. May 2011 - Inn Fashion will be attending the Great Plains Indian Gaming Association Conference & Trade show at Mystic Lake Casino Hotel. Stop by and visit us at Booth #225! April 2011 - Inn Fashion completed the installation of new bedding and window treatments at Prairie's Edge Casino Resort in Granite Falls, MN. January 2011 - Barwick Mfg. Co. was granted the National Women's Business Enterprise Certification by the Women's Business Development Center - Chicago. We are proud to be 100% Women Owned!